25-year-old onion farmer Juliana Amadeus pauses from her work in Kirya village, located in a semi-arid region of northern Tanzania. Digging her hands into the soil, Juliana Amadeus pulls up a fistful of onions with green, leafy stems. As the wind picks up, the onions’ pungent aroma wafts across the one acre farm. Ms. Amadeus drops the onions on to a large pile. Another woman picks up the onions and, one-by-one, hacks off the roots with a machete. 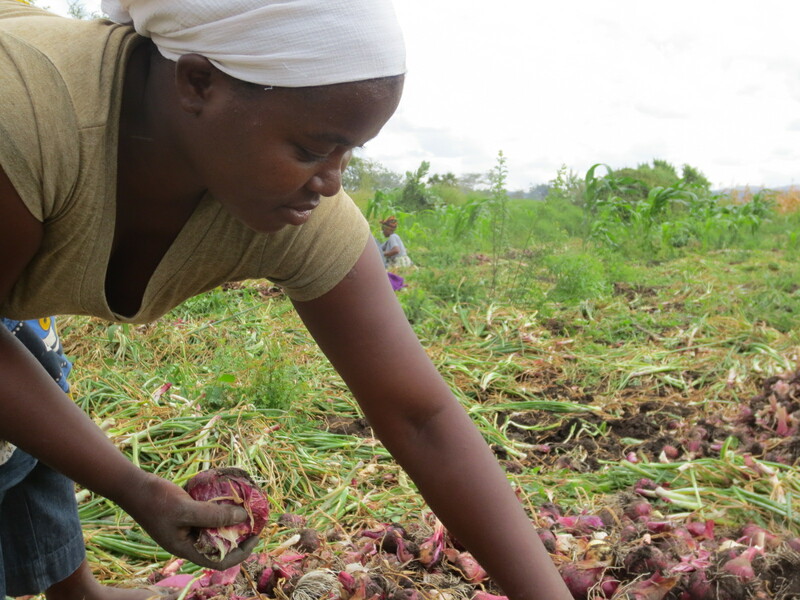 Onions usually command a good price in Tanzanian markets, but Ms. Amadeus and the other small-scale onion farmers say the price per sack has dropped by half this year. This is devastating news for families in Kirya village, located in northern Tanzania’s Kilimanjaro region, about 200 kilometres southeast of Arusha. The sale of onions is one of the biggest sources of income. Ms. Amadeus is a mother of two young boys, aged six and four. Her family lives in a one bedroom home, five kilometres from the farm where she works. 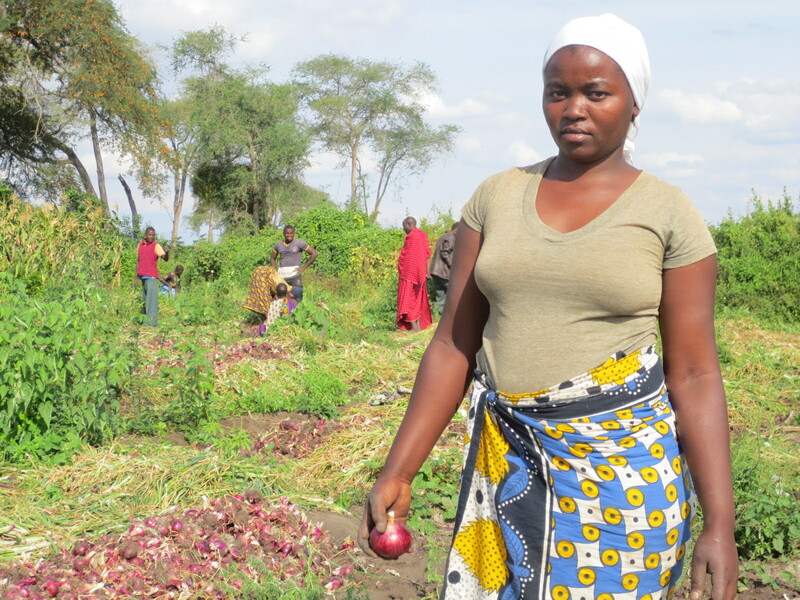 She grows onions on half of the acre plot, and maize and beans on the other half-acre. Kirya village is located in a semi-arid region of Tanzania. Due to the lack of rainwater, irrigation canals were constructed from the nearby Pangani River. Unfortunately, Ms. Amadeus’ plot doesn’t have access to this irrigation system. Ms. Amadeus’ brother-in-law, Eliraha Wazo, has dug ditches to feed water from the main irrigation canal to his own one acre plot, on which he grows onions and beans. But irrigation is not the simple answer to these farmers’ problems. The onions from Kirya are sold in Himo town market, 160 kilometres away, and middlemen control the means of transport. *In 2014, Farm Radio International conducted a mobile phone-based radio poll asking small-scale farmers in Tanzania to raise their voices and be heard. 65 per cent of farmers do not feel they have access to good markets for their crops. The results of “Paza Sauti [Raise Your Voice]” were presented to Tanzania President Jakaya Kikwete and Minister of Agriculture Christopher Chiza.